The Jack Dempsey fish scientific name is Nandopsis octofasciatum, they are from the cichlid family. They are best kept in water parameters of PH 6.5 – 8.0. Water temperatures of 78 to 85 °F (25 to 29 °C). They can grow up to 10 inches fully grown. The Jack Dempsey fish originate from Central america they are from the chchlid family, and because of this they can be a very aggressive fish. We would recommend mixing these with other bigger aggressive fish, or on there own. 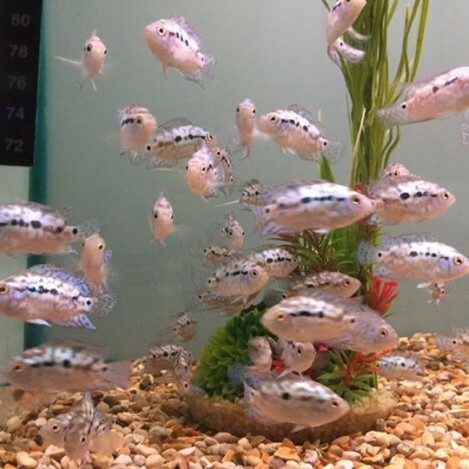 The Jack Dempsey fish have a lovely mixture of colours, the normal Jack Dempsey have a grey or brown body with a lovely mixture of green, and blue dots. But there is also the electric blue Jack Dempsey these are a lovely bright blue colour with spots. 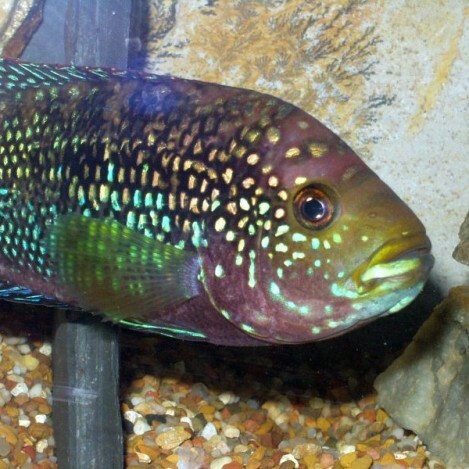 These are more rear to get so they are more expensive, but they still have the same temperament as a normal Jack Dempsey Cichlid. They will eat any foods you put in for them, and they do need frozen or live foods in there diet. They do need frozen or live foods in there diet.